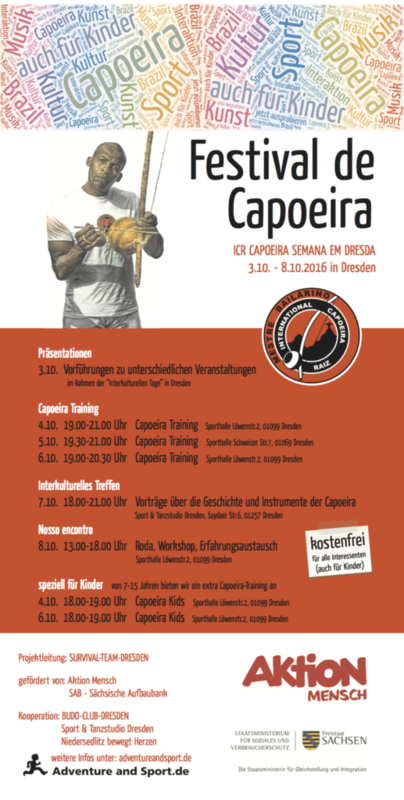 We invite you to visit “Festival de Capoeira” in Dresden in the week of 3rd to 8th October 2016 with Mestre Bailarino. One week of intensive training and the opportunity to learn with the one of the greatest Capoeira-Masters residing in Germany today. “Festival de Capoeira” is sponsored through Aktion Mensch and Sächsische Aufbaubank, therefore participation in training and events is free. Registration is not required. Bring your energy and enthusiasm for Capoeira with you! We are looking forward to see you this week in Dresden! Especially those new to Capoeira are warmly invited to attend our “Festival de Capoeira” with their friends, family and acquaintances.